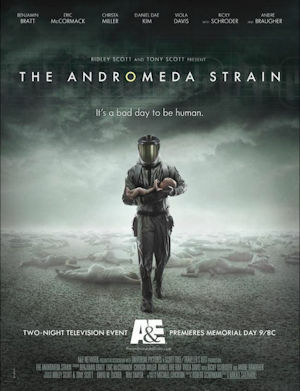 In 2008, the Sci Fi Channel produced a three-hour miniseries based on Michael Crichton's The Andromeda Strain, which was then broadcast on the A&E Network. It strove to update the story for modern times, and it pulled inspiration from popular television shows of the time like Lost and 24. Though I missed its original airing, I was aware of its existence and of the six Emmy Awards it eventually received nominations for. So, when going into it clean for the purposes of this review, I had high hopes. Alas, now that I've watched it, I feel I owe the 1971 film an apology for being so critical of it last week, because this series is much, much worse. It still follows the basic premise, for the most part: a secret satellite from something called Project Scoop crashes to the Earth and releases an alien pathogen that kills everyone in the tiny, isolated town of Piedmont. A team of scientists is quickly assembled at a high-tech underground facility powered by a nuclear device to study the disease--called Andromeda--and its two inexplicable survivors, an ulcerous alcoholic and a colicky infant. They manage to isolate Andromeda, but just as they unravel its mysteries, the seals of their lab break down, threatening to release Andromeda and set off the nuclear failsafe, killing them all. 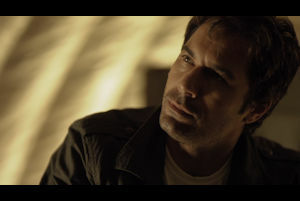 The miniseries adds several layers of plot to this outline, including the story of an addict reporter caught in the middle of the military's failing attempts to quarantine Andromeda and cover-up Project Scoop, the struggles of the President of the United States as he tries to deal with the crisis while fending off a terrorist attack at an offshore mining rig that appears unrelated, and a nefarious conspiracy from within the military that will seemingly stop at nothing to capture Andromeda for itself. The main characters--the Wildfire team studying the outer space infection--are also greatly expanded, with more disparate, fleshed-out backgrounds, personalities, and interpersonal drama. On paper, this all sounds good. There are several things about the concept of this reimagining that are laudible, that actually improve upon the novel and film. At the top of the list is the Wildfire team. Not only are they given bigger and more divergent backstories, there are also more of them, a total of five this time. While some of the backstories are fairly cliché, such as the past affair between Dr. Stone and one of his much younger, former students, they do a good job adding weight to the inevitable conflicts the characters encounter and overcome. Some of the actors are also pretty decent, if not great, especially Viola Davis (Dr. Barton, who is similar to Dr. Dutton from the film), Benjamin Bratt (Dr. Stone), and Andre Braugher (Col. Manchek). Daniel Dae Kim and Ricky Shroeder also put in respectable efforts to salvage unforgivingly bland roles, but the performances of Eric McCormack, Christa Miller, and Ted Whittall are not so respectable. 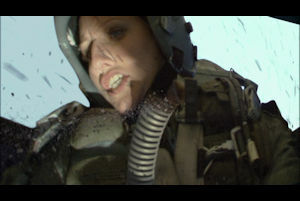 There are some plot beats that are significantly better than the source material, such as the clever combination of the Air Force pilot who crashes from a mutated Andromeda with the aborted nuclear strike on Piedmont, which actually goes off this time around, adding a lot more weight, drama, and consequence to the external half of the story. There are some neat explanations for many of the novel's random occurences that, while downplaying Crichton's chaos themes, are more satisfying and organic, such as the reason for Andromeda's release during the climax and the communications blackout with Wildfire early in the narrative. Also an improvement is the conclusion--which doesn't peter out the way the book does with a cheap ending about Andromeda suddenly mutating to a harmless form and magically ceasing to be a problem--which has the additional benefit of making the Wildfire team's efforts actually meaningful instead of relatively pointless. While we're on the subject, the plot does address the mutation problem, though the explanation is... well, I'll get to that in a minute. Other positive points worth mentioning are the flashbacks of Piedmont in the throes of infection. These aren't the most well-directed or well-acted scenes in the miniseries, but they do add viceral elements of horror, action, and drama to a story that sometimes forgets to show the stakes. I also genuinely love the interlaced scenes of the disease spreading from animal to animal and ultimately making its way out of the quarantine zone. On top of that, there are a few moments where characters stop to have scientific or philosophical discussions--many of which are pulled out of the source material practically word for word--that give the entire thing an air of scientific respectability (that it really doesn't deserve). That all said, though, the cons greatly outweigh the pros in this adaptation. While I admire some of the plot tweaks, it's worth pointing out that things go several miles off the rails, with an explanation for Andromeda that includes hyperintelligent molecules, time travel, and a solution ripped right out of Star Trek IV: The Voyage Home that panders to speculative environmentalism. There's also far too many subplots, with several serving no purpose in the end (such as the nonsense with the reporter, which adds precisely nothing to the story). 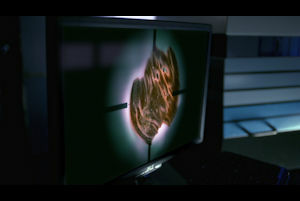 While the first half strives to stick relatively close to the story's basic outline, the second half is virtually unrecognizable, dropping important plot threads like the Piedmont survivors in favor of scenes where the characters worry about wormholes (because, in this version, Project Scoop is about sending probes to the edge of a wormhole that inexplicably appeared in our atmosphere) and government conspiracies about WMDs in Iraq. Even one character's epilepsy barely influences the plot, likely only tossed in because it was a memorable part of the original story. Unfortunately, it's also very poorly made, all around. The visual effects are notably bad, with insert screens that are more mindless than your typical NCIS-LA knock-off, CGI bird sequences that are nearly at Birdemic levels of terrible, infections that spread via PaintShop color correction, badly key-framed bluescreens up the wazoo, and some fire effects that would look embarassing on an original PlayStation. The editing is wonky; the sets are visibly cheap; and the pacing is all over the place. As for the writing, it is loaded with cheesy dialogue, character set-ups that are never paid off, laughable leaps of logic, and important plot beats that are bizarrely unclear. Worst of all are the obvious and failed attempts to be both Lost and 24, made all the more apparent by the hiring of actors who were in each. Worst of all is the science. Some of the most ingenious things about The Andromeda Strain (the novel) are the ways in which the science dictates the narrative, how mysteries are solved by scientific discovery as opposed to plot magic. These moments--like the fact that unnatural blood pH is how the survivors made it out of Piedmont alive or that the team should have autopsied the rats that were treated with blood thinners--are included in the miniseries, but as more like afterthoughts that are barely explained rather than huge moments of revelation that push the story forward. It's as though the writers used the outline of the story but tacked on a completely unrelated script for a Sci Fi Channel Original bit of science-fiction schlock about a post-apocalyptic future where mankind is forced to send a killer weapon back in time so humanity can kill it in the present but also get a sample of it which will cause the future outbreak in the first place. And therein lies the problem. Michael Crichton's novel is entertaining but serious science-fiction, whereas this miniseries is trying to be B-movie levels of ridiculous. I'm all for B-movie ridiculousness, but not in an adaptation of a serious science-fiction classic. 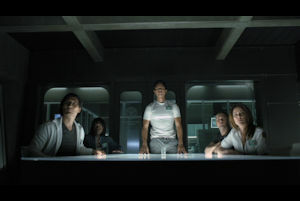 This miniseries might have worked as its own story (and with better directing and visual effects), but as an adaptation of The Andromeda Strain, it's downright awful. Therefore, in hindsight, I hereby offer my apologies for being so nitpicky about the 1971 film. Compared to this atrocity, it's a masterpiece.